There are many things to be considered when staging your home for sale, and your lighting design is an important factor that shouldn’t be overlooked. Adequate lighting is usually at the top of a new buyer’s list of priorities, and attractive aesthetic accents can seal the deal. Open houses and walk-through showings usually occur during daylight hours, but can be at any time of the day. It’s wise to assume that potential buyers are examining the home’s lighting design, and how it might fit their style and preferences. The security afforded by a well-lit path to an attractively illumined entrance and a few well-placed accent and wall lighting pieces can accentuate the design of the structure of your home and will work to your advantage. Assessing the lighting design in and around one’s home is essential. It’s easy to take the lighting design for granted after living with it for an extended period of time. When the time comes, take a methodical approach to accessing your current setup and keep these few tips in mind for selling your home. One very important question to answer affirmatively is: Do all of the lights work when you flip their switch? Repairs present an opportunity to change or upgrade a fixture or lighting setup, so look on the lighter side of a challenging situation and invest in a brighter future for the property. A home filled with natural sunlight makes for a cozy and cheerful environment. 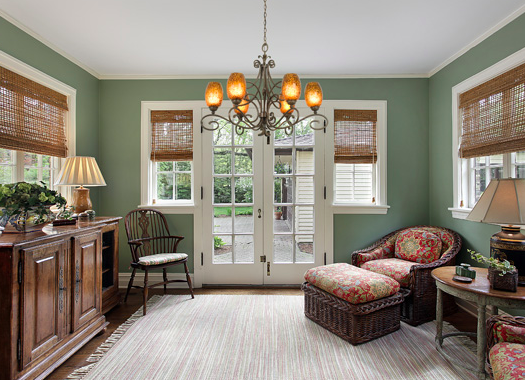 One of the least expensive adaptations you can make to enhance the appeal of your home may be to replace heavy drapery with window treatments that allow rooms to be drenched with warm golden sunlight. Buyers will benefit from a clear vision of the property’s natural source of illumination, but we know that concerns for lighting design only begin with the light that streams in through the windows. Rooms that don’t receive an abundance of natural light or provide a less-than-showcase-worthy view are benefited by attractive window treatments and appropriate supplemental light – even in the daytime when the home is being shown. Investing in an attractive lighting fixture in a dimmer room is worth consideration. The most desired aspects to lighting design are satisfied by a simple dimmer switch. Dimmers have the ability to quickly transform high-functioning task lights into a soft, tranquilizing, ambient glow, and they’re fairly quick and inexpensive to install. Bedrooms and baths require clear bright functional lighting for the practical purposes of grooming and dressing, but a dimmer switch will promptly transform these rooms into the destinations of privacy and leisure that we love and dream of. Accessory lamps or sconces with filament bulbs can add another layer to your lighting design and infuse these rooms with an essence of dreamy timelessness. Entryways, hallways, and family gathering spaces generally require mid-to-low-level lighting that can be easily accommodated with sconces using gorgeous filament bulbs that range up to 60 watts each. It’s widely asserted that the kitchen sells the home. With this in mind, making some investments in track lights, under-counter lighting, pendants, or stunning chandeliers are likely to pay off in the eyes of your prospective buyer. A well-lit home with attractive accents is sure to capture the attention of potential buyers, and improvements to your lighting design are worthy investments that support the fundamental structure of the property. As you browse our showroom, just imagine what unique, stylish fixtures can do to enhance the value of your property.